Alfonso Cuarón's astronaut epic Gravity really does begin with a single 17-minute opening shot! 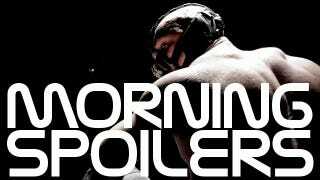 Christopher Nolan talks Dark Knight Rises villains, while Joss Whedon hints at a Captain America character's fate. Plus a crucial Doctor Who casting update, and more on Man of Steel, Lock-Out, Fringe, American Horror Story, and the Short Circuit remake! "[Bane] represents formidable physical strength, combined with absolute evil of intention. [Catwoman] has a very strong way of protecting herself and those she cares about, which implies an underlying darkness." "It's a risk, because we could be laughed at - or it could be very fresh and exciting. The audience mustn't be too concerned about the mumbly voice," says Hardy. "As the film progresses, I think you'll be able to tune to its setting." Here's a new Thor-focused TV spot. Also, for a breakdown of the Loki and Tony Stark clip from yesterday, go here. One of the best scenes that I wrote was the beautiful and poignant scene between Steve and Peggy [Carter] that takes place in the present. And I was the one who was like, Guys, we need to lose this. It was killing the rhythm of the thing. And we did have a lot of Cap, because he really was the "in" for me. I really do feel a sense of loss about what's happening in our culture, loss of the idea of community, loss of health care and welfare and all sorts of things. I was spending a lot of time having him say it, and then I cut that. Why not! It was the one character - you know, I was a comic book fan when I was a kid and I always loved the Hulk. When The Incredible Hulk, that show, came on, I would not miss that. And so if I was going to find myself in that world, this would be the guy that I would be most interested in doing. To make a very short answer long: Yeah, I'd love to have him do his own movie. When Zack [Snyder] and I were talking about it the first time, he was saying how Superman, they want to give it a more edgy feel like The Dark Knight but also make it more realistic and emotional so it's not just the all-american superhero that saves everyone. He has dilemmas and love and struggles throughout the whole movie, especially when he's a kid. "Instead of trying to create real people and what they're doing, let's turn it around and create almost an entirely animated film and then backwards engineer the people into that film," he explained. "As a matter of fact, let's not even engineer the people into the film, let's engineer their faces. So you've got these little faces inside these little helmets. But there was a big hiccup that we came to I didn't realize until later, which was that we began building it as an animated film and Alfonso had an idea that he wanted the shots to be incredibly long, and I said, ‘How long?' And he said he wanted the first shot to be really long. And I said, ‘You mean, 40 seconds?' ‘No, 17 minutes.' So it ends up the film only has 156 shots in the entire two-hour movie, many of them six, eight, 10 minutes long. No, it's certainly not a big budget (laughs) but you know, in a way—and I don't mind it—it is leaning to a B-picture aesthetic, but that part of it is slightly deliberate. [Producer] Luc [Besson] and I were talking about the tone of the film, and Luc's recent action movies he's produced, there's an awful lot of kicking heads if you like, but one thing that I wanted to do is that I wanted to try and go back to the stuff in the '80s where the lead anti-hero is reluctant and vulnerable and when he gets hit, it hurts. He's not super martial arts, and that's something Luc used to do years ago in the '80s with "Leon" and "Nikita," so while we were writing it, we were aware of Luc's films and those kinds of films of the '80s and '90s. I think it's really obvious. (Laughs) I think the clip just went up on the 'net where he cuts her hair to disguise her and that's completely from "Nikita," something that Luc did.... A lot of [Guy Pearce's] roles have been very serious, very earnest, and in "Lockout," he's the complete polar opposite of that. He's not earnest at all. He's blunt, he's sarcastic, he's rude, so I think when Guy read the script, he got it, and I think he wanted to try and have some fun with it. No, I think you're right. It will be interesting to see what audiences think of him in this role, because it is definitely a different type of thing for him. I think he's great in this, he really pulls it off. We shot it in Belgrade, Serbia. We built all the sets in studios in Belgrade, so we had four or five (stages). The studio in Belgrade was a new build and they had all these new studios there, so I think we had four 20,000 square foot stages, all filled to the brim with sets. The other thing that James Mather did, which was really clever, was he built the sets for 3D and prelit them in 3D, so if you imagine him building all the sets and where the lights go in all sets, so you're kind of prelit when you arrive, so you get all the electricians to light the sets as he had lit them on a 3D model, so everything is prewired and prerigged and set up and that allowed me to be a lot of freer and just follow the action without stopping and starting and trying to keep the fluidity of it going, which is what they used to do in the '80s. They didn't have the 3D technology but it's that kind of thing, it's what they used to do. Here's a new clip from Joss Whedon and Drew Goddard's horror movie. You can also check out the link for an introduction to the clip by star Chris Hemsworth. "The thing that makes it so relevant is that we live in this age of robots, particularly when it comes to war. We have drones that do our fighting for us, do all these jobs men and women don't want to do. And that's what makes this so interesting — things like this moment in the story when Johnny realizes he's going to be disassembled and contemplates death, and whether it's right to terminate someone else. These are heavy themes for a family movie. But I think they can have their place. "I'm tempted to go back and grab the original. But I think it has to be closer to what modern design actually is. There are computer models and labs developing real machines like this. We want to do something like that. You've got to find the balance between something fierce and something endearing. The original was cute. But no one was threatened by it." Here's a trailer for next week's nineteenth episode, "Letters of Transit", which is as weird and experimental as previous seasons' nineteenth episodes. Here are some sneak peeks for tonight's episode, "Entanglement." CASTIEL AWAKENS FROM HIS COMATOSE STATE - Meg (guest star Rachel Miner) calls Dean (Jensen Ackles) and Sam (Jared Padalecki) and tells them Castiel (guest star Misha Collins) is awake and talking. Meanwhile, a teenager named Kevin (guest star Osric Chau) gets hit by a bolt of lightning and is turned into a reluctant prophet. Sam and Dean believe Kevin holds the key to defeating the Leviathans but must fight off two Archangels who want him for their own purposes. A DAY WITHOUT A VAMPIRE - Klaus acts on his intentions to leave town with Elena (Nina Dobrev), but finds resistance from a surprising new enemy. Bonnie (Kat Graham) calls on Abby (guest star Persia White) to help her with a difficult spell. As events spiral out of control, Elena is determined to protect Caroline (Candice Accola), Damon (Ian Somerhalder) and Stefan (Paul Wesley) enlist Tyler's (Michael Trevino) help, while Bonnie and Jeremy (Steven R. McQueen) take a terrifying risk to make sure her spell is effective. Damon and Stefan have a surprisingly candid conversation about the future. THE CIRCLE DOES MAGIC TO FIND THE REMAINING CRYSTALS - When a crystal is magically stolen from the abandoned house, the Circle decides it was the traitor witch working with Eben (Sammi Rotibi) so Jake (Chris Zylka) calls for a meeting with Isaac (guest star JR Bourne) to see if they can get him to change sides. Cassie's (Britt Robertson) loose grasp on her dark magic threatens to destroy any possible alliance when their pursuit of the traitor leads them to the "Creepiest Place on Earth." Meanwhile, Faye (Phoebe Tonkin) and Jake (Chris Zylka) work together to steal Dawn's (Natasha Henstridge) crystal, Melissa (Jessica Parker Kennedy) and Adam (Thomas Dekker) pair up and uncover a new magic trick. Meanwhile, a frustrated Diana (Shelley Hennig) reaches out to Charles (Gale Harold) for help. PROM NIGHT IN CHANCE HARBOR - It's Prom night in Chance Harbor and after Adam (Thomas Dekker) uncloaks a crystal hidden in the school, Blackwell (guest star Joe Lando) tells Cassie (Britt Robertson) she can use her dark magic to find it. When Cassie follows this advice, it leads her to a dangerous discovery. Meanwhile, Faye (Phoebe Tonkin) invites Jake (Chris Zylka) to Prom, despite the fact that he stood her up two years earlier. Adam, Diana (Shelley Hennig), Cassie and Melissa (Jessica Parker Kennedy) finally make it to Prom but when they lose the crystal to Eben, they end up in a life and death situation. Meanwhile, Dawn (Natasha Henstridge) attempts to stop Blackwell, who casts a deadly spell on Charles (Gale Harold).